Ferrari watches are the result of cooperation between watch companies and the legendary sports car manufacturer. Hublot, Girard-Perregaux, and Panerai all have diverse models, predominantly chronographs, embellished with the Ferrari logo. Fans of car racing and hobby racers are two of the most important buyers of Ferrari watches. The car manufacturer from the northern Italian town of Maranello has been producing exciting sports cars since 1947. Other companies are fascinated by Ferrari, and the same is true for watch manufacturers such as Hublot and Girard-Perregaux. Like Ferrari, they're renowned luxury brands in their field. Wearing a watch from one of these companies makes quite a statement. Time plays a pivotal role in car racing. Circuit races are all about achieving the fastest possible lap times, whether in the qualifying races or the official race. Due to the close relationship between time and racing, cooperation between sports car and watch manufacturers is not surprising. Both parties can profit from marketing with each other. Watches have versatile uses in professional racing. They can be worn by the driver, used in the pit, and used to time laps. Laps are timed with the most advanced, modern chronographs that can time to 1/1000th of a second. A mechanical chronograph doesn't cut it in that case. With a Ferrari watch on your wrist, you're emphasizing your love of fast cars and the Ferrari brand. Moreover, many Ferrari watches impress with their sophisticated technology and detailed designs. Some high-tech materials incorporated into these watches are also used for racing cars, such as carbon. Which Ferrari watch should I buy? If you're looking for a Ferrari watch, you should first answer the following question: Do you want a watch with a classic, sporty look or a watch with a modern, rectangular or porthole design? 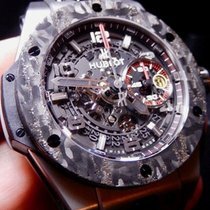 If you want a watch with a more modern design, then you should take a look at watches from Hublot. The Big Bang Ferrari model from this Swiss manufacturer starts at 16,000 euros new. The watch is made of either titanium or ceramic. Titanium is lightweight and robust. This makes a difference, as the 45-mm diameter titanium Big Bang is considerably lighter on your wrist. Ceramic is used and beloved for its high level of scratch resistance. The Big Bang Ferrari also has versions made of gold. Particularly noteworthy is their patented Magic Gold alloy. 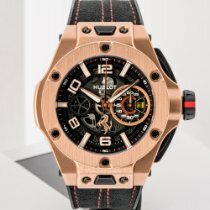 Hublot successfully created an alloy made of a mixture of ceramic and gold. This resulted in an extremely hard material that can only be scratched by diamonds. A Magic Gold Big Bang Ferrari costs about 22,000 euros. If you want a red gold case, then you should be prepared to spend at least 30,000 euros. A watch with a tourbillon caliber raises the price to 100,000 euros. The Hublot MP-05 LaFerrari costs around 200,000 euros. Its futuristic design is reminiscent of a sports car motor. Founded in 1980, Hublot is a relatively young manufacturer. Giard-Perregaux is the exact opposite. With a founding year of 1791, the manufacturer is one of the oldest in Switzerland. You should consider Girard-Perregaux's Ferrari watches if you're a fan of more classic, traditional watches as opposed to Hublot's modern designs. The Ferrari Chronograph 8020 has a black dial with the Ferrari logo located below 12 o'clock and its case is made of stainless steel. It has a tricompax layout with the 30-minute counter at nine o'clock, 12-hour counter at six o'clock, and the small seconds at three o'clock. The Ferrari Chronograph 8020 is no longer being actively produced; it ran from 1994 to 2004. However, it has a timeless design and a relatively small diameter of 38 mm by today's standards. This makes it a perfect watch for those with smaller wrists. Prices for the standard version start around 2,000 euros. One variant of the 8020 has a yellow dial and black inscription; in very good condition, these cost 2,700 euros. The most expensive Ferrari watches from Girard-Perregaux are in a completely different price range. Models made of white or yellow gold cost around 24,000 euros. With a platinum case, the price rockets upwards to 100,000 euros. Ferrari also worked with Panerai, another prominent watch brand. The two are a good combination: Panerai produces their watches in Switzerland, but their headquarters are in Milan and they have close ties with Italy. Prices for Panerai's Ferrari watches start at 3,000 euros. Many feature the Ferrari logo in the same position as the watches from Girard-Perregaux, beneath 12 o'clock. Panerai often designs their Ferrari watches as bicompax chronographs. More expensive models, however, have three subdials, making them tricompax chronographs. Some are double chronographs. These watches cost around 6,500 euros in very good condition. You should be prepared to spend about 17,000 euros for a Grand Turismo chronograph with a gold case. At the lower end of the price spectrum you can find watches from Scuderia Ferrari starting at 100 euros. Usually quartz watches are found in this price range. For around 300 euros you can purchase a quartz chronograph with a steel case. Ferrari watches use three colors characteristic of the company on their dials: red, yellow, and black. The distinctive Ferrari red is called Rossa Corsa and is the color of the traditional varnish used for Italian sports cars, just as British Racing Green was used for English racing cars for many decades. Alfa Romeo and Lancia also use red. Relationships with sponsors, however, have since made colors irrelevant for racing teams. Yet Ferrari remained true to red for many decades. Up until the turn of the century, most customers ordered red Ferraris. However, that number has since dwindled to below 50%. The red color featured on the dials of Ferrari watches is an important element that connects them to the brand. Often, the subdials are red. Even the stitching on the black leather strap is red. The same applies to yellow: It is part of Ferrari's logo and was frequently used by watch designers. The logo is a black prancing horse against a yellow background, the Cavellino rampante (Italian for "prancing horse"). Sometimes the letters SF are added, standing for Scuderia Ferrari. The yellow represents Modena, where Ferrari was first based. Yellow is the background color of the city's coat of arms. Additionally, Ferrari's founder, Enzo Ferrari, loved sunflowers. That is often given as the reason for the logo's yellow background. Ferrari's current watch partner is Hublot. Jean-Claude Biver, president of Hublot, claims that this partnership has given Hublot a massive boost in popularity. The Ferrari watches from the successful Big Bang series are the backbone of the cooperation between the two companies. The most unusual watch, however, is the MP-05 LaFerrari. It has eleven barrels, raising the power reserve to 50 days. Usually, wristwatches have a power reserve of only about 40 hours. The MP-05 LaFerrari doesn't display the time with hands and a dial, but rather on cylinders. On the right side are the cylinders for hours and minutes, while the power reserve display is on the left. The mainsprings aren't wound by hand, but rather with a mini pistol similar to the ones pit crews use. The MP-05 LaFerrari has 637 individual pieces. The standard version has a microblasted black PVD titanium case and the special edition has an impressive sapphire glass case. The price for the sapphire glass version is about 400,000 euros, almost as much as a Ferrari sports car.